These are 3D models for a program called MikuMikuDance. Although 3D and usually used for making music videos, there are infinite possibilities in life. 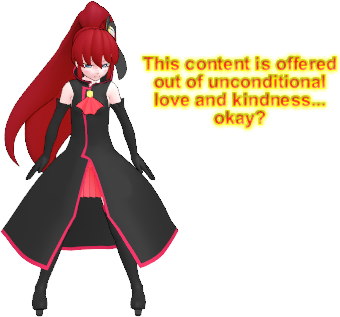 Lovely Warriors of Friendship, a 2D Platform Game, contains many graphics generated by MikuMikuDance. Tutorial on how to do that. I believe in unconditional love and harmless sharing, so I will share as many things as possible here. Priority goes to stuff used in LWF, or stuff I plan to use. Disclaimer: I did not make these models myself.